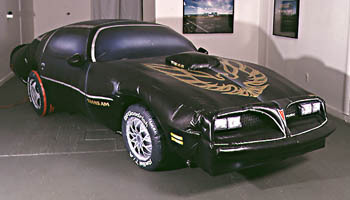 Inflatable Stage I Trans AM. Trans AM drawing tool in action. Burnout drawing on paper. While doing a burnout Guy Overfelt was arrested by SFPD. Guy hired Tony Serra to represent him in the criminal jury trial, and two court room sketch artists. Serra and his team got the case dropped the day of the jury trail. On March 29th, 1998, 7:30 pm, Guy Overfelt had Tony Labat shoot him with an Air Taser. One probe hit Overfelt’s chest and the other his nose, piercing through his nostril and causing him to fall to the ground.